“The hourglass door has closed behind Dante, sending him back in time to hunt down Zo, Tony, and V. Abby knows that Dante, as a Master of Time, is the only one who can stop them from destroying time itself. She also knows that he will need her help. But almost immediately, things start to change, and Abby’s worst fears are realized when Zo begins targeting her past specifically. I get so tired of smutty books. You know the kind: books with content that is salacious, contain foul words, etc. Call it what you want, but for me I decided some time ago to pick books very carefully so that I feel better after having read them, rather than feeling like I just descended into some filthy mud puddle. I enjoyed the first chapter as it introduced us to Stacie as a child. I found the scenario very compelling and believable and I could empathize with this young person who had been blamed for a crime that was not her fault. Flash forward eight years and you now find Stacie aware–more so than the average individual–of children’s suffering. This propels us into the story where Stacie now determines to sacrifice herself to try to wipe away the guilt she carried from the experience in the first scene of the book. This is Ronda Gibb Hinrichsen’s first novel. Although there were a few spots where I felt transitions could have helped make a scene or two feel less coincidental (i.e. the diner scene), I thoroughly enjoyed this book. Ronda has a second book set to come out this spring. I am excited for her. I feel that she is a writer that will continue to bring books to bless us all… books that will get us to think and help us to stand outside our tiny worlds and consider the world of another. You just might find yourself more aware of the importance of kindness and courage after reading a book by Ronda Gibb Hinrichsen. Kudos to her for writing pleasurable fiction that uplifts and doesn’t leave you feeling like you’ve rolled around in a filthy mud puddle! Here is a link to her website and here is a link to where you can purchase your own copy of Missing! I cannot wait to read her next book… and that is saying a lot for me. Karen Hoover is an author with a heart of compassion and inventive playfulness, all wrapped up in delight. I met Karen Hoover at an event for writers several years ago. At that time, she told me of a manuscript she had worked on for years, but was having trouble finding a publisher. Imagine my delight when this year I heard her happy news. THE SAPPHIRE FLUTE: Book One The Wolfchild Saga had been picked up by Valor Publishing. Recently I received an ARC (advanced reader’s copy) to review here. I received the copy for free and when it came in the mail, I remember holding it and thinking back to my discussion with Karen so long ago about her two characters in this story, and how long she’d been nursing them to life. “It has been 3000 years since a white mage has been seen upon Rasann. “In the midst of a volcanic eruption miles outside of her village, Ember discovers she can see magic and change the appearance of things at will. Against her mother’s wishes, she leaves for the mage trials, only to be kidnapped before arriving. In trying to escape, she discovers she has inherited her father’s secret–a secret that places her in direct conflict with her father’s greatest enemy. “At the same time, Kayla is given guardianship of the Sapphire Flute and told not to play it. The evil mage C’Tan has been searching for it for decades, and the sound alone is enough to call her. For the flute to be truly safe, Kayla must find its birthplace in the mountains high above Javak. My first impression of the book came from my children. My son in particular was fascinated. We began reading the story out loud together. But soon, he was carrying the book everywhere. He read it once. Then he read it again. Then he read it again. And when he wasn’t reading it, he was carrying it everywhere (we put a stop at it coming with us to church). Is this a book to recommend to kids? Absolutely! I am thrilled for Karen. Her story which had been nestled for 17 years in her heart now is in print for many to read. Here is where you can get your own copy. The only qualm or quandary about the book? It is a seven-book series…which means that not all plot twists are resolved (obviously) in the first book. So Karen, please get those fingers typing as fast as you can. We want to know this story from the front of it . . . all the way to the very end! 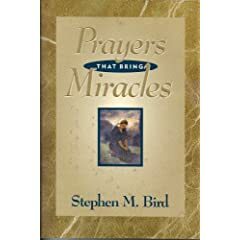 I received a free book in the mail recently from a publisher requesting that I read the book, Prayers That Bring Miracles by Stephen M. Bird, and consider writing a review. I never know how these experiences will go. Honestly, there are some books I do not feel hold up to the premise stated on the book’s cover. There are other endorsement on the back of the book equally as glowing. Thus, I was curious as I began reading the book for myself whether or not the book could live up to this kind of exuberant reviews. Now that I have spent time with this book myself, I know why the reviews were so positive. The author Stephen M. Bird’s words and his approach to the sacred matter of prayer have changed my life. This book has changed my life. From the story entitled, “Chaplain, You’ll Never Believe What Happened,” to teaching me to better trust the prayer/answer process, to understanding why it is the Lord answers prayers, I love this book. In fact, I kept waiting for something not to like. Reviewers are supposed to do that, you know. Find at least one thing that is yuck about the book and mention it to appear that you are balanced. I find that approach to reviewing books ridiculous when there isn’t anything to quibble with during the reading. That’s how this book moved for me. I read chapters, stopped, pondered the meaning. OK, well, here perhaps could be one complaint. And yet it is not a complaint…it is a call for spiritual maturity. If you’re wanting a quick read, one that doesn’t challenge you, this book is NOT for you. These chapters cannot be read swiftly. That would be like eating in a $500/plate restaurant, but staying only long enough for the lemon-with-water glass brought at the beginning of the meal. No, Stephen M. Bird’s book is to be read slowly. Pondered. Experimented with. Just the chapter “The Road to Faith in God” was worth the entire exposure to the book. He delineates how to get rid of skepticism, one of the biggest impediments to sensing answers from God and to receiving them. That chapter is worth the entire book. But would I want only that chapter? No. I would want the whole book. And now that I have it, I give thanks for the opportunity given me to review it. Here are the chapters contained in this book. Read this list and consider if this book doesn’t belong on your bookshelf or especially the bookshelf of someone you know who is struggling with “why doesn’t God answer my prayers?” The chapter titles may appear simplistic, but their content is anything but. Remember those glowing reviews? I now want to add mine. You can find this book online at Amazon.